Thrift is a lightweight, language-independent software stack with an associated code generation mechanism for point-to-point RPC. Thrift provides clean abstractions for data transport, data serialization, and application level processing. The code generation system takes a simple definition language as input and generates code across programming languages that uses the abstracted stack to build interoperable RPC clients and servers. Thrift makes it easy for programs written in different programming languages to share data and call remote procedures. With support for 25 programming languages, chances are Thrift supports the languages that you currently use. 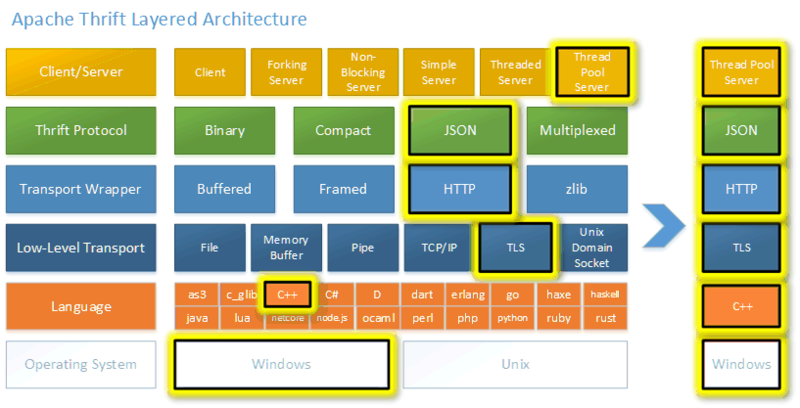 Thrift is specifically designed to support non-atomic version changes across client and server code. For more details on Thrift's design and implementation, see the Thrift whitepaper included in this distribution, or at the README.md file in your particular subdirectory of interest. Thrift does not maintain a specific release calendar at this time. We strive to release twice yearly. Download the current release. Contains the Thrift compiler, implemented in C++. To build the same way Travis CI builds the project you should use docker. We have comprehensive building instructions for docker. See http://thrift.apache.org/docs/install for a list of build requirements (may be stale). Alternatively see the docker build environments for a list of prerequisites. Thrift was inspired by pillar, a lightweight RPC tool written by Adam D'Angelo, and also by Google's protocol buffers. Note that some language packages must be installed manually using build tools better suited to those languages (at the time of this writing, this applies to Java, Ruby, PHP). Look for the README.md file in the lib/<language>/ folder for more details on the installation of each language library package. There are a large number of client library tests that can all be run from the top-level directory. This will make all of the libraries (as necessary), and run through the unit tests defined in each of the client libraries. If a single language fails, the make check will continue on and provide a synopsis at the end. This will run a set of tests that use different language clients and servers.